By default, our Libraries are sorted by year. You can filter what you want to view by using the "View Manuals by Manufacturer" bar at the top of the page. Platinum and Gold members that desire to purchase a PDF download must log in to take advantage of the membership price. All of our digital content has been scanned from our original vintage literature collections. Some items may have stains or other age acquired flaws, while others may be almost perfect. We have hundreds of manuals still in our collection to scan and archive. Once the literature is archived, digital downloads are available, and the original literature is made available for sale in our store. All of the literature in the AutomotiveTimelines archives have been scanned from original literature. Once an item is scanned for the website, it can be offered for sale. Check out the AutomotiveTimeliens store for car and truck literature you can purchase. 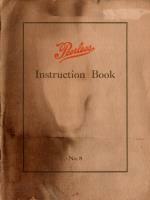 This 1919 Chandler Book of Instructions is very soiled in many places. The AutomotiveTimelines collection of instruction books are in the best condition we can reasonably obtain for the collection. This 1919 Chandler manual is proudly displayed for historic value as it has survived the years.